Lenovo has published an excellent guide for management of their BIOS settings via scripts for the ThinkPad-series. It seems that it does apply for all different series (ThinkCentre, ThinkPad, ThinkStation) and therefore the same methods can be used regardless of the type of device. However, there are numerous caveats to the documentation and some minor misalignments of naming standards between specific device types – even within the same series of devices. Password seems to be quite odd for Lenovo. First of all – password can’t be set the first time around via their WMI interface but requires that someone sets on the device. In addition – the experience has been that depending on the type of keyboard (validated with a Lenovo and an HP set of keyboards) the password might not be set as expected. In the end – we could only validate what the password was (and use the expected password) when set with an HP-keyboard. Note that at the end there is a ;. Ascii and us is the encoding and the language of the keyboard. This is the most common setup – so lets stick with it. If you are unsure wether there is a password or not – we can always test and validate. If you configure all settings incorrectly and then try to save without the appropiate password (blank or with the correct password) – all settings are lost. To avoid writing lots of code once we have identified if a password is in use – we can leverage the $password and append it to every settings. In addition – once these settings are enabled they can’t be disabled. Lenovo has taken a secure-by-default stance and will force someone to physically access the computer to decrease security. 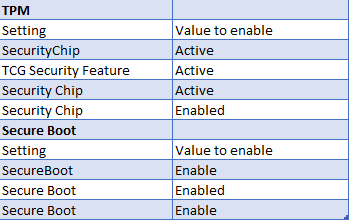 As far as their guide states today the following settings can’t be disabled – once they are enabled – via WMI. 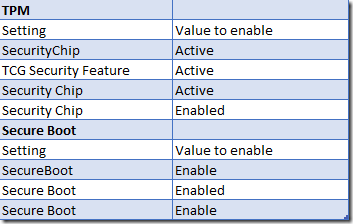 Previous Post ConfigMgr and “Who updated All Systems–again”?